And just like that, it's over. 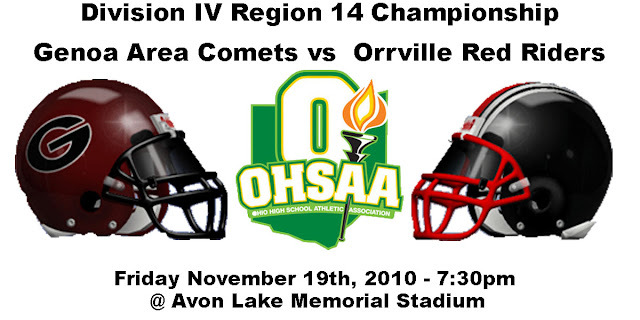 Another season of Orrville football has come and gone, the 101st season if my numbers are correct. The 21-3 loss to Chagrin Falls was not the way we wanted to go out, but on that night they were the better team and I wish them luck this Friday as they take on Bishop Hartley for the D-IV crown. It stinks to see things end. We're very proud of the team but when a season ends short of the ultimate goal, it's always so sudden and so final. What makes the Orrville sports community special is what makes it very difficult at times too. It's not a curse, that's the wrong word, it's just part of being a fan. You have to be invested as a fan, and with that investment comes an acknowledgment that you have to take the good with the bad. Some choose not to be invested, fearing a letdown. I guess I've never been that way. I try to enjoy the ride, knowing that you're always one game from the end, and there's never a gentle letdown. It always comes to a screeching halt. I wish our kids could have had a shot at the big prize this Friday morning in Massillon, but it wasn't to be I guess. But you find the good...the silver lining, and you move on. We'll turn the page to basketball and wrestling, then to baseball, softball and track in the spring. Let's talk (quickly) about the Chagrin Falls game and look to next season. We'll talk some basketball too and throw in a few other things for good measure. Two fine college careers came to an end this past weekend as 2007 OHS graduates Kyle Simmons and Josh Bowman played their final collegiate game for Ohio Northern as they bowed out of the NCAA Division 3 Playoffs with a loss at North Central (Ill.), 28-9. Josh was the Polar Bear's 5th leading tackler on defense this season with 61 stops, 4 being for losses and he also had 1 interception. Kyle had a very productive season and a 4-year career that, statistically, will go down as one of the best ever at ONU. For the 2010 season, he had 2,023 passing yards to go along with 670 rushing yards and 29 total touchdowns (19 passing, 10 rushing). He will end his career having the most rushing yards (1,336) of any QB in ONU history, the highest career completion percentage at 59.1%, the 2nd most completions with 448, the 4th most passing yards all-time with 5,479 and maybe most impressively, Kyle will leave with more total yards than any other player in Polar Bear history with 6,815. Kyle was also named All-OAC 1st Team for the 2nd straight year. Wow. Two shining examples of student-athletes. Congrats to both on a great run and thank you for making Orrville proud. Coaches: Doug Davault is 42-17 in his 5th season at Orrville. He has a 7-2 career playoff record in three appearances. This is his first appearance in the state semifinals. Mark Iammarino is in his 16th year as Tigers coach. His career record is 108-58, including 10-6 in the playoffs. He has guided the Tigers to 7 of their 8 playoff appearances in school history. 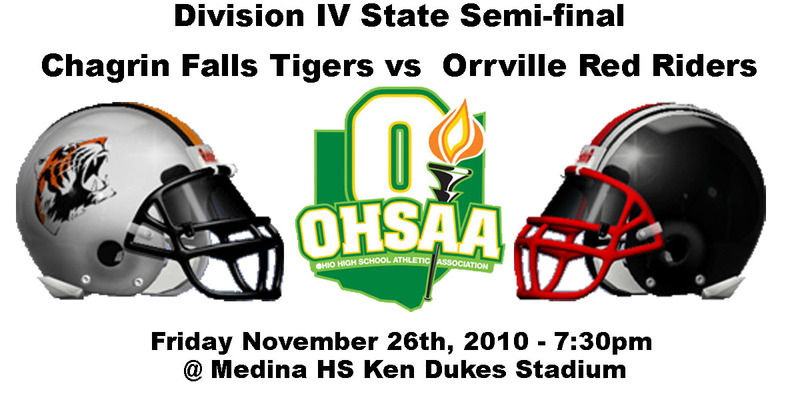 Playoff History: Orrville is making their 21st appearance in the state playoffs, their all-time record is 28-19. Chagrin Falls is making their 8th all-time playoff appearance with an all-time record of 11-7. They are 7-1 in the playoffs over the last two seasons. How They Got Here: Chagrin Falls defeated Garretsville Garfield (22-7), Cortland Lakeview (54-28) and Manchester (37-14). Orrville defeated Triway (27-25), Elyria Catholic (22-14) and Genoa Area (16-6). Radio: WQKT 104.5 FM will broadcast on-air and on-line at WQKT.com. Akron's WZIP 88.1 FM will also carry the game, online too. Trying to combine everything into one post. Short week and family gatherings mean less time for blog reading/writing. This one and the game preview will be about all I have time for before Friday. I do want to send a HUGE thank you to all the readers/followers of the site. It's a broken record and I apologize for constantly repeating it, but I'm just blown away at the latest readership numbers. Since the Monday of Wooster Week (October 25th) through this past Sunday (November 21st), there have been over 8,000 site visits and over 20,000 page views. That's roughly double the visitors & page views from the same time period last year. November is already the biggest month in site history, and we still have at least one more week of football to go. In the spirit of Thanksgiving, I'm thankful for all those who contribute ideas, suggestions, comments and even criticisms. All are a part of making this site special. My fellow Rider fan and OrrViews colleague Ned Hostetler mentioned in his latest article that his drive to keep doing his historical looks-backs for OrrViews stemmed from all the positive comments he received, and the fact that people anticipate his next article. I couldn't have put it any better. I've said before that I'd still run this site even if nobody read it, but it's nice to know that folks appreciate the site. It's always been my drive to give you informative, accurate & even-handed content that represents the knowledge and passion that so many of you demonstrate. The fact that so many of you are faithful readers is terribly humbling. It didn't take me long to figure out that my words have impact, and I will continue to take that responsibility very seriously. Enough about me....let's get to the good stuff. What a night that was. What a great all-around game by the entire team. This team is peaking at the right time, our defense is playing awesome. Last night was the 9th regional title in school history, and first since 1999. Now it's on to the state FINAL FOUR and a date with the Chagrin Falls Tigers this Friday at Medina. This team has a look....a legitimate look at the state title. No one's getting ahead of themselves, but this team has a real chance to be the last team standing. Who'd have thought that at the beginning of the year? We have the talent on offense, a strong defense, and capable special teams. We're also battle tested. The scary part is we can still get better. Let's talk about the Genoa game and all the lovely, lovely details of another playoff victory against an undefeated Comet team. Last Meeting: Orrville beat Genoa in a 2009 Region 14 semifinal, 36-35. Coaches: Doug Davault is 41-17 in his 5th year for Orrville. His playoff record is 6-2 in three appearances. Genoa coach Mike Vicars is 46-4 in just his 4th year as Comet coach, including a 7-3 record in four playoff appearances. He's 146-97 in his coaching career with an all-time playoff record of 12-10 (11 appearances). How they got here: Genoa beat #5 seed Ottawa-Glandorf 7-6 in the first round and upset #1 seed Clear Fork, 38-29 in round two. 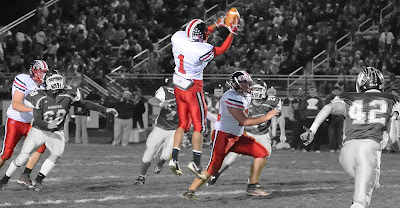 Orrville beat #6 seed Triway in the first round (27-25) and upset #2 seed Elyria Catholic last week by a 22-14 score. Radio: WQKT 104.5 FM will broadcast the game over the air and also online at wqkt.com. Playoff History: This is Orrville's 21st all-time playoff appearance, their all-time playoff record is 27-19 with one state title (1998). They have won regional titles 8 times. Genoa is making their 4th appearance, with an all-time record of 7 wins and 3 losses. Their only regional title was won in 2008. Here's some advice on managing the potential parking nightmare around Avon Lake Stadium. I was informed that there will be a drama club play on the same night as the Orrville/Genoa game, and that half of the already limited parking spaces at the school will be reserved for that event. In looking at the area in and around the stadium, parking was already quite scarce...but no worries...shuttle buses to the rescue!! See the map below for available parking and pickup/dropoff sites for the shuttle buses. Better and make plans ahead of time. Leave a few minutes earlier and be patient and I'm sure all will work out. I hate taking the focus off the Red Riders regional championship game this week against Genoa, but I'm not exactly the only one reporting this. Orrville senior Max Pirman and junior Mason Monheim visited Lincoln, NE for the 'Huskers game versus Kansas at Memorial Stadium this past Saturday. Max had previously committed to Indiana, but lately there has been some talk about IU coach Bill Lynch being on the hot seat, especially after Wisconsin hung 83 points on them. All of that was enough to give Max pause and at least re-evaluate his situation. How about them Riders? What can you say about the effort that was put forth by the ENTIRE TEAM? I know it was only an 8-point win, but it was very convincing to me. I said it in the preview that we'd need to be excellent across the board to win. And that's pretty much what happened. Let's discuss it all and look forward to the regional final versus those pesky Comets from Genoa. Picture from the Lorain Morning Journal. Article and more pics here. Full gallery of game pics here, courtesy of Rod Dilyard Photography. Last Meeting: Elyria Catholic 14, Orrville 13. 1984 Division III State Semifinal. My 1984 playoff lookback including the original game article is here. Playoff History: Orrville has qualified for the state playoffs 21 times. Their playoff record is 26-19 with one state championship (1998). Elyria Catholic has 14 appearances, their record is 16-10 with 3 state titles (1976, 1983, 1984). Coaches: Ben Malbasa is in his 4th season as Panther coach, this is his 2nd playoff appearance. His record is 31-11, including a 1-1 record in the playoffs. Doug Davault is 40-17 in his 5th year as Orrville head coach. He's 5-2 in 3 playoff appearances. Radio: Wooster's 104.5 WQKT will broadcast the game on-air and online at WQKT.com. WEOL 930 AM will also carry the game. Their website is here, can't really tell if they'll be webcasting, but I'm guessing so. Other Region 14 Game: In the other semifinal, #4 Genoa takes on #1 Clear Fork at Tiffin. Both teams run the ball almost exclusively so this game should take about 90 minutes to play. It may be over by the time the Orrville game is at halftime. In a rematch from the 1984 Division 3 playoffs...two of northeast Ohio's most accomplished programs will meet on the field for only the second time. The winner gets a berth in the regional title game. It's preview time...and for this week, I've asked a special guest to handle the Elyria Catholic side of things. Read on for all the wonderment. Another playoff game...another heartburn inducing, down-to-the-wire finish. In the end, Orrville survives and advances. Let's talk about the game, the great performance turned in by Stewart Turner, the gutsy effort from the Titans and plenty of other topics. I know it wasn't the cleanest performance ever, but a win is a win. Think of it this way, Orrville is one of 16 teams in division 4 (and 1 of 96 in the state) that aren't cleaning out their lockers and turning in their uniforms this week. This is a good thing. Pictured at right...the 2010 Elyria Catholic Panthers. Numbers-wise, they're about the same as Orrville. Orrville senior Nathan Rosenbaum clocked a time of 16 minutes, 30 seconds in the Division 2 State Cross Country race in Columbus earlier today, good enough for a 27th place finish. His time was nearly 30 seconds quicker than his regional time of 16:56 (14th place). Coming out of a stacked Boardman, Nathan was one of 11 regional qualifiers to finish in the top 30 of the state meet. Full results form the D-2 race is here. Congrats to Nathan and his family. He was named OCC Boys Runner of the Year, won the Ohio Cardinal Conference meet as well as the Wayne County Invitational and was the first Orrville male runner to qualify for the state meet since 2000 (Ryan Hochstetler). Hochstetler, who is one of Rosenbaum's coaches/trainers said that he thinks Rosenbaum's finish is the 3rd fastest finish in a 5,000k (3.1 mile) race at the state meet by an Orrville runner, behind 2-time state champ Ben Weeman and Ben Stangelo. Not sure on the time of Stangelo, but Weeman ran a 15:14.6 in 1983 which earned him a 2nd consecutive state title. I spoke to Nathan's father last night and he said he is looking to major in engineering in college, and would like to continue competing in cross country. He mentioned Ohio Northern as a possible college destination for Nathan. Cross Country is an interesting sport. 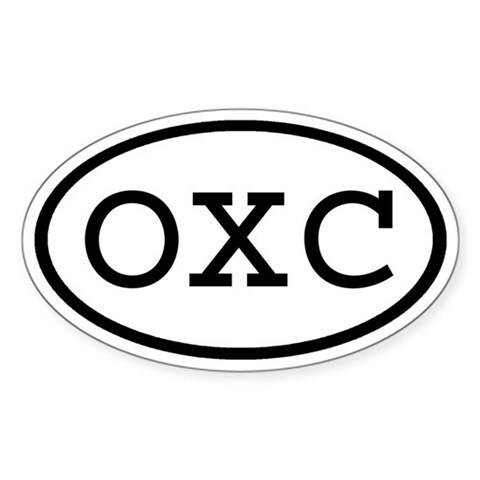 I know every sport requires off-season preparation, but that's where cross country meets are won, in your off-season conditioning. Nathan put in the work and his running this season were a direct result of that work and dedication. It's a testament to his hard work and drive, and will serve him well as he endeavors on his college and post-college careers. Well, now that it's out in the open, I guess I'll chime in on it. 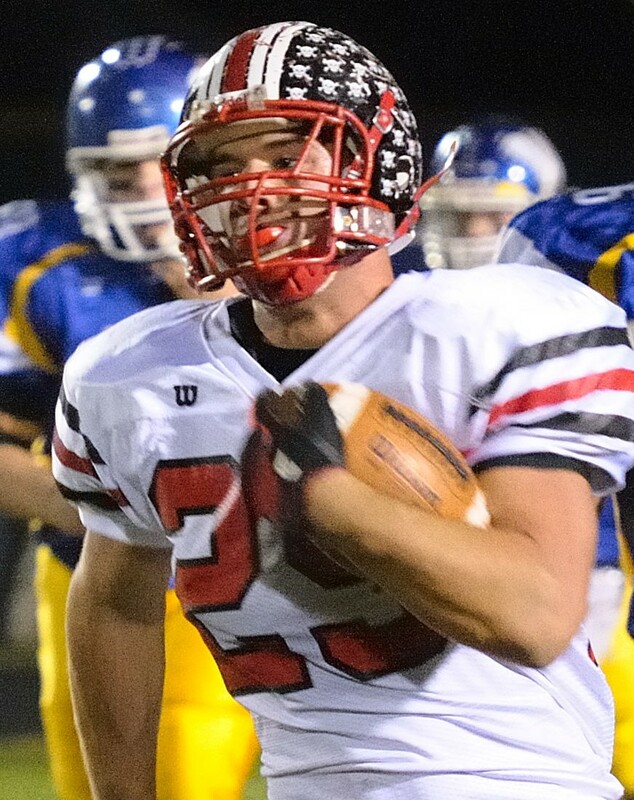 As of yesterday afternoon, Orrville junior RB/LB Mason Monheim received his first football scholarship offer...and it's a big one. Last Week: Orrville beat Wooster 42-17, Triway beat Canton Timken 41-0. Playoff History: Orrville is making their 21st and second consecutive playoff appearance, their all-time playoff record is 25-19. Triway is making their 5th appearance, and is 2-4 all-time in the playoffs. 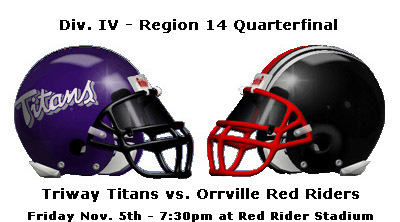 Triway is making their 3rd straight trip to the playoffs. Their last playoff win came in 2003 over Manchester (21-14) in round 1. 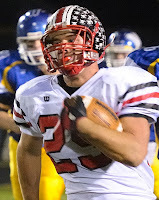 Coaches: Doug Davault is 39-17 in his 5th year as Orrville coach, he's 4-2 in playoff games. Tony Lee is 16-5 in his 2nd season as Triway coach, he's 0-1 in the playoffs. Radio/TV: Options aplenty...WQKT 104.5 FM out of Wooster will be doing the game, naturally. Also, 95.3 WKLM out of Millersburg and WZIP 88.1 FM out of Akron will be broadcasting as well. So depending on where you are, you could possibly listen to the game on three different FM radio stations at the same time. Both WQKT and WZIP have live streams on their website, I know for sure that WQKT will be streaming the game at wqkt.com, I imagine Z88 will stream the game as well, here. Oh yeah, Clear Picture cable out of Wooster will also be doing the game....and Fox8's SkyFox will be there too. The load limit of that pressbox will be tested Friday night. I'll be sending updates to my Twitter and Facebook accounts. Don't bother checking both, it's the same update, just sent to both services. Or just stay here on the blog homepage and keep an eye on the Twitter gadget on the right hand side of the page. Refresh every 20 minutes or so for the latest. Other Region 14 Games: #8 Ontario travels to #1 Clear Fork, #7 Huron travels to #2 Elyria Catholic & #5 Ottawa-Glandorf travels to #4 Genoa Area. The entire D-4 bracket is here. Lets talk football, I hardly ever do that, right? It's playoff time, and it's the OHSAA's biggest tournament, so there's so much more information floating out there than any other sport. 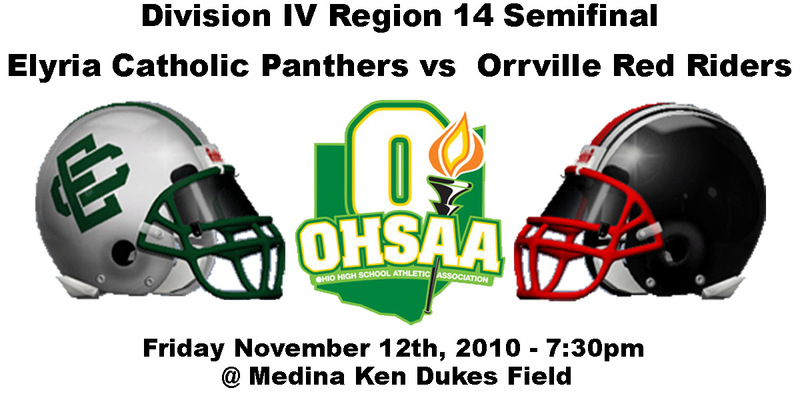 Here's some information as it relates to Orrville being in the playoffs and some historical information too. 'Woo Who?' Indeed. 42-17. Sixth straight win is very nice. But don't let anyone fool you....it was a nervous week. A week after being shutout by Clear Fork, I don't think I was alone in NOT knowing what to expect from this team, and that was concerning after nine weeks. All I, and everyone else, knew was that two straight losses to end the year would have been bad. And late Friday night it became more clear that if we lost to Wooster, we'd be traveling to Ottawa-Glandorf for the first round of the playoffs. Nobody wanted that. But nobody really knew which Orrville team would show up. Would we get the team we saw in week 2 that dismantled Triway, or would we get the inconsistent team that was prone to penalties & turnovers? In a distracted week of special events like the Senior Assembly, Bonfire, captains lunch, no school on Friday and all the pre-game activities on a Saturday night in Wooster, it just had all the makings of a tough night for the Riders. I got confident when I saw all those Red Rider alums form the tunnel for this years Rider team to run past. At that moment, it was like all the good vibes, all the hard earned victories, all the sacrifice and all of what encompasses 'Red Rider Tradition' was passed from past decades of Red Riders to this years team. It was then I knew that it was just a matter of playing Rider football. We weren't losing this game, and we didn't. For the 24th time in the last 34 rivalry games, the red, White & black came out the winners....and Wooster's all-time lead is down to single digits (50-41-9). That hasn't happened since WAY back in 1935 when Wooster held a 16-7-3 edge over the Riders. On to the minute details....PS - photos by Rod Dilyard. Full gallery here. I'm sorry if you've already got this info from the Booster Club via e-mail....just doing my part to get the word out. Below is ticket info for Thrusday's volleyball match with Gilmour Academy, Friday's football playoff game versus Triway....and info on Orrville senior Nathan Rosenbaum running in the state cross country meet. Thanks to Kent Smith and Deb Goudy in the athletic office for getting this info out to the masses. If anyone is planning to attend all three (and possibly four if the girls win on Thursday), give me a shout. Got an idea for a little road-trip assignment.